Born in the Parisian rues and the Berliner strasses, BÊTE NOIRE is the match point of the simple and meticulous stylistic research of Maximilien Brunon, Bianca Koczan and Dunja Marija Kopi. Met in Paris, while working for the Atelier Moritz Rogosky et Isabelle Ballu, then they moved to Berlin, considering it the most experimental city of Europe. Coming from different backgrounds, the three designers found an ideal style that brought them to develop a simple line of clothes, so far from the contemporary fashionisms. BÊTE NOIRE, in fact, is not characterized by “fashionable” pieces but by quality garments made with care to achieve a timeless and stylistic perfection. Maximilien Brunon answers to our questions and explains: “BÊTE NOIRE was created to satisfy those who want to wear an item forever and maybe choose the same one in different fabrics and shades of colour”. With the desire to set up a continuing line and to add classic styles in each new collection, the designers create an high quality, limited product, wearable but away from the mass productions, and present only one collection per year, as a capsule. To support their work, they collaborate with different companies as textile design, clothing and leather accessories consultants. This allows BÊTE NOIRE to grow up without the help of large investments. 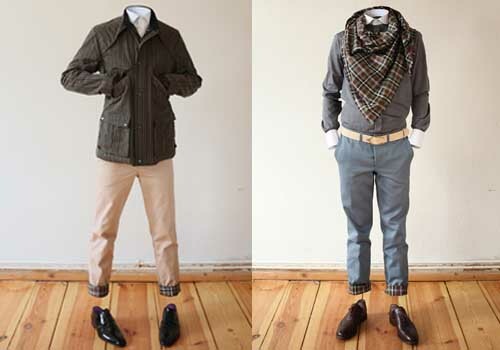 The mens’ ad womens’ 2012 collection follows the philosophy of the brand. Each garment is made with care, thought in its traditional form but modelled with modern silhouettes and enriched in details. BÊTE NOIRE seeks the archetype and studies it in particulars, fabric and colour. 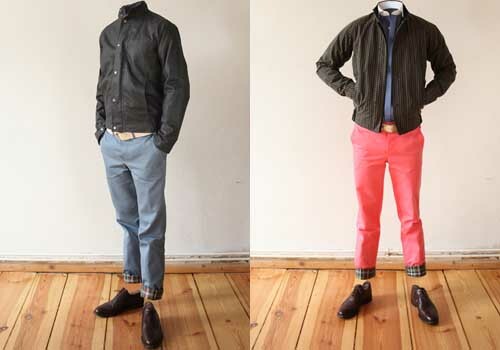 The focus is on the creation and the development of tailored chino pants, uniform jackets and classic shirts with traditional detachable collar. The selected colours go from beige and brown, to red, blue and green. 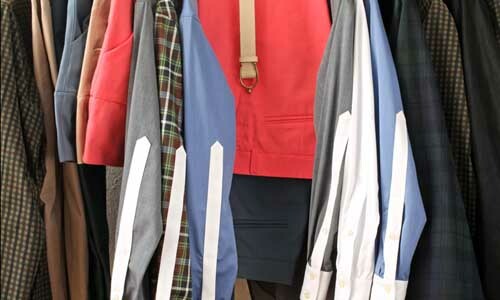 Skirts and pants are made with the prestigious English twill and waxed cotton, while shirts are made with austrian cotton; the leather used for the accessories is kept the most natural as possible, so get a unique vintage look over the time. Traditional clothes are revisited with timeless taste, tailored for those who love and appreciate the hand-made manufacturing and not consider them just “wearable art”. 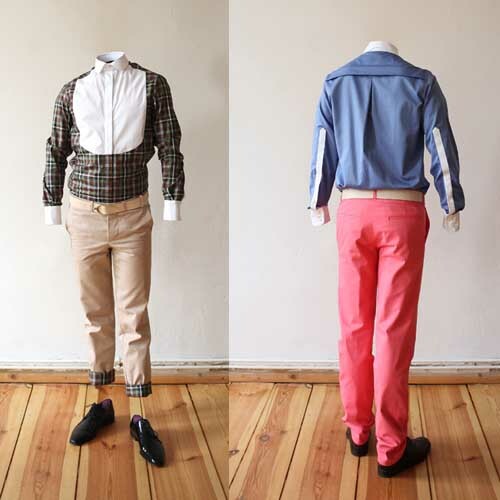 “We don’t see fashion as art” – Maximilien adds – “you can find it in museums and it isn’t part of our creative process. Our clothes can just be a medium through which reflect it”. Following this idea, Brunon worked on an installation entitled FOSSIL, inspired by the fashion world. 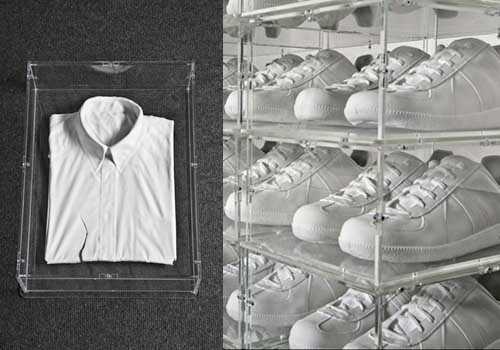 Through a process of mineralization, Brunon has tranformed a shirt and a pair of shoes into objects of porcelain, to emphasize the complexity of manufacturing process and underline the fashion industry usual method of copying and suggesting always the same styles. Maximilien Brunon says: “Minerals will last forever, or at least much more than contemporary clothes. They could be found among the ruins, and will represent design pieces that belonged to another age”. Brunon concludes : “We produce classic garments with a contemporary twist that will help you to feel good with yourself”. BÊTE NOIRE is the tailored comfortable elegance. 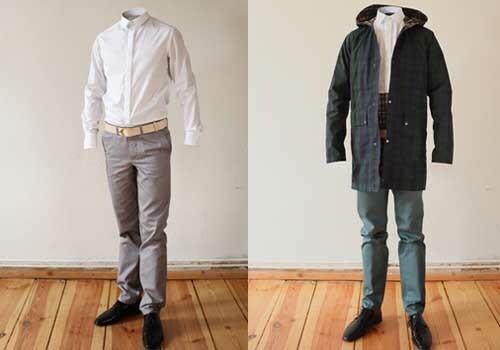 Visit the official site www.bete-noire.com and find them in Berlin on 19th and 20th January, at the (CAPSULE) show.